I responded to an article where the poster was morally upset because someone made an "unfair" thing: tried to corner the market, bought all the strange dust, and relisted them for the "too" high 8.5G/stack, 566% of normal price. My response was mostly: being angry is pointless, one can act by breaking the monopoly. In this case I suggested the mass product ion of strange dust by crafting and disenchanting a cheap tailoring item. I got strange comments from Druanor. He seems to be a businessman, who use to make such schemes. "I would simply wait for you to tire of the game and then go back to what I was doing before you so rudely intruded into MY market squeeze. Laughing all the while. ... It is dependent on an old psychological trick that you can play on people. A form of manipulation. Basically it amounts to letting the other person think they won, so that they forget about whatever it is your doing and this in turn, lets you go ahead and do what you were doing. So by temporarily withdrawing (ignoring his auctions in this case) he soon looses interest (after a couple of days when he sees your not responding to his ploy) and justifies it with that smug little thought of "I won". Just as soon as I see he isn't interested anymore I would put my auctions (at the inflated prices) back up and probably never hear from him again"
And also he wrote: "Thirdly, did you appoint yourself the offical AH scheme killer on your server? I mean who voted you king and let you decide which schemes get used and which get your disdain appointed to it. Sheesh man, lighten up. You write up all these wonderful schemes and then you say you would go to all that trouble to undermine someone else's? And all that work over Strange Dust. I mean what do you care?" This businessman (and many other), did not understand the wonderful theory of Adam Smith. He seems to believe that I'm "intruding" his scheme for "winning" mostly motivated by some sick "I'm the king of AH, I decide what happen on this server" idea. No! Actually, I don't even have to recognize it's someone's scheme. If my auctioneer gets bugged and displays only ?????? as the poster's name, I act exactly the same. I do not fight anyone, just responding to a market situation for my own profit. Lot of businessmen are bottom-scanning. They seek underpriced stuff, buy them and sell them on median price for profit. I do it too, when I bump into such bargains, but that's not my major workhorse. More of my profit is coming from investing (buying in mass when cheap and selling after a patch when it becomes more interesting), but most of my profit comes from "top-scanning": seeking items that are mostly overpriced. If the auctions of item X are listed between 150% and 999%, then it's an item with increased demand. I find a way to supply to this increased demand. I find a way to craft the item in need and sell it in this boosting market. I'm not trying to defeat anyone, I'm just selling high. If the item in question is Strange Dust, the proper action is tailoring-disenchanting. If it's Cobalt Bar (like it was on last saturday), it's buying Cobalt Ore and smelting. If it's Eternal Belt Buckle, it's buying saronite and finding a blacksmith. If it's Infinite Dust, it's buying Eternal Earth, finding a JC for Stoneguard band and disenchant. As long as there is increased demand, I'll supply making profit. If the reason of the demand was some moron trying to corner the market, and he was not so blatant to relist on 500%+ under one name, I most probably won't even notice that I'm killing his scheme. If he just ignores my auctions but keeps on buying other auctions (of people who listed around or below the old median price), than my auctions will be the lowest, and people keep buying them, so I keep on selling for profit. This case he keeps on buying up the increased supply coming from the increased farming of the item (as higher price generates more farming). This goes on until he runs out of money or bank space. He ignores the whole item at all for days. This case the "normal" people listing on the old median undercut me, forcing me to lower my prices and stop the production. I will most probably undercut them to clean the items from my bank. If the wannabe monopolist returns a week later, I will notice the price jump again (I use to check on the items every week that made me profit once), so I start the production again, undercutting him again. Notice that during the whole thing I responded only to prices in the AH. I did not tried to fight anyone, and most probably don't even notice a person behind the thing. Yes my dear wannabe monopolist, I crush you without even noticing you. Am I that strong? Am I the king of AH? Am I "turned soft" and protecting the people of my server from evil monopolist? No. I'm just a guy who follows his own profit. "It is not from the benevolence of the butcher, the brewer, or the baker that we expect our dinner, but from their regard to their own interest. We address ourselves, not to their humanity but to their self-love, and never talk to them of our own necessities "
Adam Smith appointed me and everyone else to be scheme killer on my server. 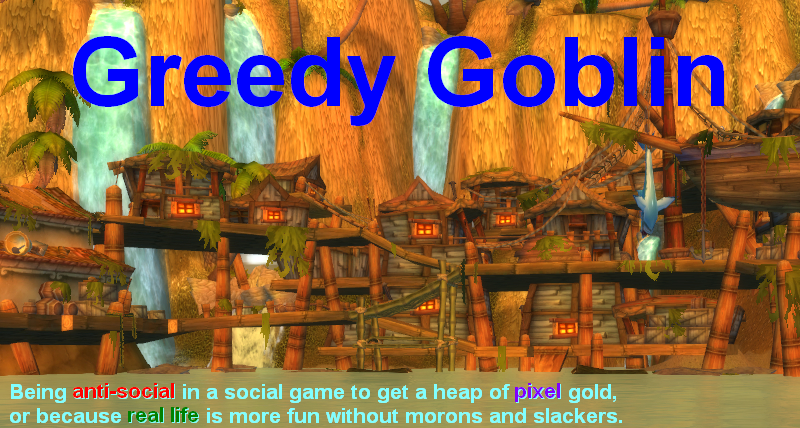 The only reason why monopolist schemes can exist, either in WoW or the real world, is that lot of people are unable to follow their profit because they are too ignorant, or lack the seed money for it. PS: I've already sold 8 Expert Cookbooks from yesterday getting 32G profit for a single flight to Desolace. Thanks Ghoulette, keep up the dumb work! This is exactly what I said in response to the original WoW Economist article: wherever there exists a way to make things better for the consumer, there is profit to be made. Whether you make him give up listing or you make him buy up your own auctions is besides the point. Both benefit you and the average person buying stuff on the auction house! This is happening right now on my realm with low to mid level herbs. One player on several charcters buys up anything below the price that HE sets and he relists them all as 20 stacks for hugely inflated costs. I assume it is working since he has continued this practice for several weeks now. Centuri-- Hugely inflated compared to what? As farming low lvl herbs is harder than farming high lvl herbs, given the proper mounts for the area, the natural price were only lvl 80's farming for herbs is actually higher for low lvl herbs. So, that's the elastic portion of the supply curve. But, there's also a relatively inelastic portion of supply from people who are low lvl and herb while questing, or high lvls who switch to herbalism and are leveling. Perhaps this person is from another server where the low lvl herb prices are much higher, and so he realizes that with a slight nudge to absorb a bit of the inelastic supply, that the market price will rise to follow the elastic demand curve. Or perhaps he just figured this out by trial and error....or yet again it could be that he's just absorbing a loss out of persistence, but I'd wager one of the first two explanations is true. This is what I was talking about with my earlier posts...some markets are bad for cornering attempts, some are good, depending on the underlying supply/demand curves. @Kurt: I've never thought of that, but you are right. Low level herbs have higher production cost (mostly measured in time) than Outland and Northrend herbs. However the inelastic supply (the low levels and the profession shifters) usually supply enough for the demand of the low-level herbs, keeping the price low. However this can change as certain glyphs are desired by lvl 80-s, yet need low level herbs to craft. For example Glyph of Thunderclap needs Mageroyal, Briarthorn, Swiftthistle, Bruiseweed, ore Stranglekelp. If the demand overcomes the inelastic supply, the herb prices can reach the 1-2/piece region. I've idly wished that the AH was a completely blind auction anyway. Making things personal by listing sellers only introduces silly emotions into the mix. Atlantica Online and Puzzle Pirates both have blind auctions, and it serves them well.